David Liss is a LibraryThing Author, an author who lists their personal library on LibraryThing. 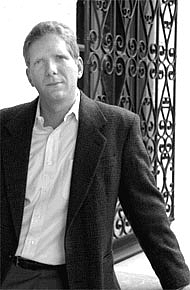 See David Liss's author page. On to the previous booksK A Conspiracy of Paper (which won the Edgar Award for Best First Novel) and A Spectacle of Corruption were both national bestsellers. They are set in 18th century London and feature Benjamin Weaver, a Jewish former pugilist, thief-taker for hire. Weaver will be back in 2009 with The Devil’s Company, but he’s featured in a new short story, The Double Dealer” in the anthology Thriller , edited by James Patterson. The Coffee Trader is set in 17th century Amsterdam. It was also a national bestseller, and is a book group favorite. My most recent novel, The Ethical Assassin , is a contemporary animal ights thriller about door-to-door encyclopedia salesmen. For more information, or perhaps for different information, you can visit my web page at www.Davidliss.com Otherwise, if you are interested in my books, or just want to talk about books in general, please be in touch. About my libraryI will only post books I like. I don't believe knocking down other writers in public.